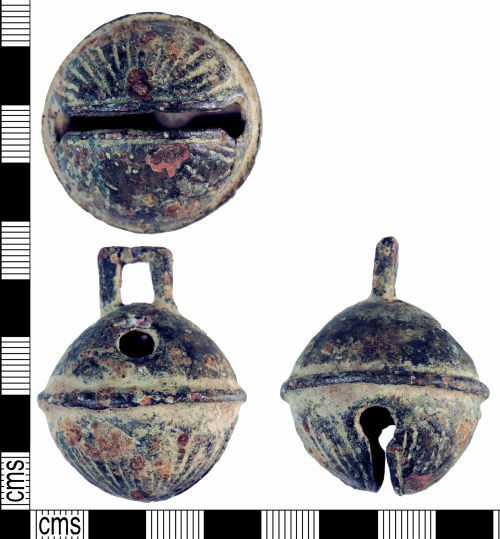 A complete cast copper alloy crotal bell of post-medieval date. The bell is divided into two hemispheres by a median, raised band which was intended to imitate the earlier two-piece crotal bells. A rectangular suspension loop with central perforation projects from the top of the upper hemisphere and is flanked by two sounding holes. The upper hemisphere is undecorated. The lower hemisphere bears an elongated ovate sound slot and is decorated with four petals radiating either side of the sound slot. The pea is missing. The metal has a mid brown-dark green patina and is worn. The bell is 40.98mm long, 32.68mm in diameter, 1.36mm thick and weighs 26.26g.